Lottery games all over the world are exciting because you never know if your set of numbers will make you the next multimillion-dollar jackpot winner. Unfortunately, scammers know this too and will want to prey on your naivety, trust, and confidence. Here are the top ten lottery scams swindlers try to use. If you do remember joining Toyota, Hyundai, or any other automaker's lottery, maybe you actually did win whatever incredible prize some agent who emailed, texted, or called you claimed you did—but probably not. 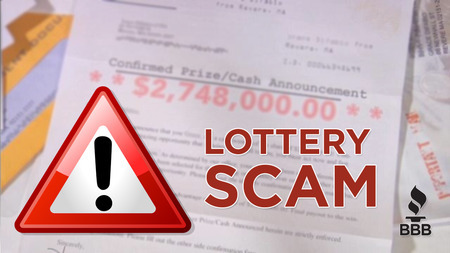 Kidding aside, when you find a famous brand name and the word "lottery" in any form of communication, be extra cautious. Check whether the game exists by contacting the brand immediately. Ripoffs based on big brandnames are among the most successful, as they prey on people's trust in the brands themselves. This is exactly how spoofing scams work too. 2. "We'll Need a Processing Fee to Send the Check"
The "advance fee" scam will never grow old. In the past, these came in the form of a Nigerian prince who is willing to share his riches with you if you help him transfer or wire money into your country. They would then ask you for "processing fees" to move their money, which, of course, never arrives into your account. Change "Nigerian prince" into "you won the lottery, but we need your help to proceed," and you have a fraudulent offer on your hands. Legit lotteries only allow players to claim their winnings, especially grand prizes, from its country of origin. You will shoulder all travel and accommodations, and all the taxes and bank service fees you will encounter once you deposit your check in person. Just like the Nigerian prince scam, a millionaire who claims he or she had won the lottery in his or her country plans to move the money into your country for varying reasons, which might be because he or she wants to avoid exorbitant winnings taxes in his or her country. He or she will ask you to provide your bank account details, and he or she will ask you for further "processing fees" to help with the entire process. Uh huh, sure thing. If you do not remember joining any real-world lottery such as EuroMillions, US Powerball, or Eurojackpot, that is probably because you did not buy a ticket for it. It can be hard to remain skeptical when millions of dollars are at stake, but if you bite, you allow the scammers to bite into your wallet too. If you are in the same country as the game in question and join it frequently, make sure you do everything you can to verify if you did in fact submit an entry. If you are not sure, ask the agent about your full name or the serial number of the ticket they claim you own. Never succumb to your initial delight at the prospect of having millions and try to remain skeptical until the money is actually in your hands or bank account. This variant of the "processing fee" or advance fee scam uses a corporate entity. The scammer will claim that he intends to pay a debt to a particular company or your employer using a sum he or she had won from a recent lottery, but he or she needs your help to process this payment. The swindler could also use your employer's name to persuade you into revealing your bank account. His promise to you is you can get a percentage of his or her winnings. The fraudster is likely to ask for a processing fee, claiming he needs it to pay for wire transfers and other details. However, if you give him your bank account number and possibly other vital personal information, he can use this to blackmail or extort you, such as telling authorities you were attempting to steal the sum he might deposit in your bank account. One morning, upon checking your postal box, you venture upon an envelope with a check containing millions from a famous international lottery company. Inside the envelope, a win notice tells you that your entry had won a particular game that you do not recall joining. Lottery organizations require all winners to travel to their countries of origin to claim their check upon presenting their winning stub. In most countries, these organizations need to secure affidavits to send out amounts that are more than $500 or more through checks, wire transfers, bank deposits, or any other money transfer methods. 7. "I Am Selling a Winning Ticket"
Scammers can sell tickets they claim to be winners of substantial non-jackpot prizes online or offline. Most communication you will receive will say you can buy the tickets at half the winnings it can give you. If you think about it, no one will want to sell a winning ticket even if it only has a small secondary prize because you can always keep the maximum profits to yourself. In the real world, only swindlers will ask you to buy such tickets from them. To pressure you into buying, another subordinate who will appear as a stranger might express his or her wish to purchase the ticket. Scratch cards, which have the potential to win at least $1,000,000 in winnings, are often the victim of entry swapping during offline play. If you possess a winning scratch card, you must only submit it to the lottery organization and not to the individuals where you bought the scratch card. Some store clerks can be possessed with greed when presented with winning entries and keep them for themselves. Any tampered entry, whether a lottery ticket or a scratch card, should be questioned before purchase. Scratch cards are frequent victims of "pinning," a method that allows store owners and clerks to scan a specific bar code or serial number with their scanning machine and determine whether it is a winner without scratching off the numbers. Hollywood may have made the game of cards and other forms of gambling a measurable game of probabilities. In the case of lotteries, you are contending with hundreds of millions of players worldwide, which makes it extremely difficult for top-tier minds to measure probabilities and create a sure-fire method for successfully winning the lotteries each time. You should consider products and ebooks sold by so-called "lottery gurus" or "brand" lottery systems automatically as fraudulent. Even though it might be possible for someone to crack the formula for winning, with all the profits from victorious entries, no one in their right mind would sell this method for relatively small change. A reputable online ticketing or betting service will proudly write about their past winners either on a blog or news section. They may also publish such news on their homepage. Check with news sites about winners who used the Internet gaming company you're thinking to play through. Published at the bottom part of every e-game company's website is their license number, and the authority who had granted it. Gaming commissions from Curacao, Malta, and the United Kingdom regulate their e-games companies strictly. A company that loves its players will provide excellent and helpful customer service. Gauge the efficacy of answers their Live Chat support gives you. A straight-to-the-point answer accompanied with quick results can generally be considered a trustworthy online service. Forums focused on topics about your particular online lottery service deliver a wealth of reliable information from a host of players. Don't see what you're looking for? Don't be shy! Start a thread asking specific questions about the company's reliability. Our online reviews dive deep into the heart of any lottery ticketing or betting service. We detail everything companies have from payment options and prize claiming, to recent winners and playing terms and conditions. We pride ourselves on providing accurate and up-to-date information, so hopefully you'll enjoy reading our online lottery site reviews as much as we enjoyed researching and compiling them.